Original two-page Swiss magazine advertisement from the year 1957 for Omega Watch Company, Switzerland. 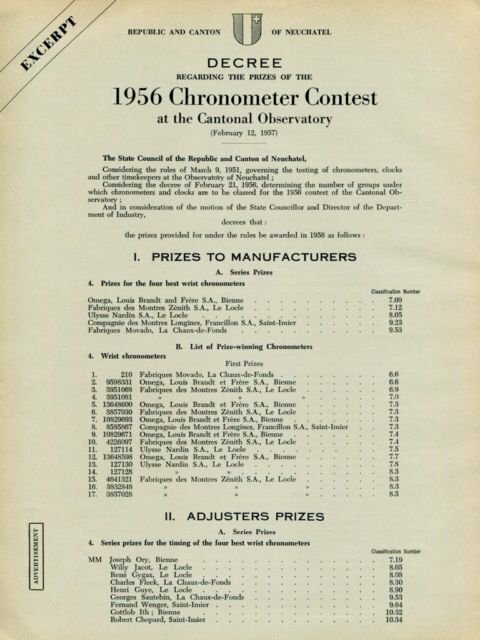 One page of the ad shows an excerpt of the results from the 1956 Chronometer Contest at the Cantonal Observatory. The advertisement was carefully removed from a Swiss magazine. The ad is comprised of two separate pages. Each page of the ad measures approximately 7 3/4 inches wide by 10 1/4 inches high. The ad is comprised of two separate pages.